Read all about the hero of time! The Legend of Zelda: Ocarina of Time is one of the best video games of all time. Viz media is bringing the manga version of the game to the masses in the Legendary Edition. The manga was originally released in a ten-volume set but now will come in new versions with updated cover illustrations. There will also be updated illustrations in color by creator Akira Himekawa. Link needs to find the three spiritual stones of Hyrule lore to save Princess Zelda as well as the land of Hyrule. The Kokiri’s emerald, the Goron’s Ruby, the Zora’s sapphire and the ocarina of time are needed to open the door of time inside the temple of time. This in part will open a path to the Master Sword as well as the Sacred Realm. This adventure is represented beautifully in the manga and any Legend of Zelda fan will want to pick this up! The manga also throws in some minor humor that wasn’t in the game such as how Link and Navi interact with each other and how Link and Mido interact. The writing doesn’t have the same ability the game had with music to keep the player entertained but it does have humor and looks. The illustrations look fantastic and could come to life at any moment. You wouldn’t want Ganondorf to jump off the page but he’s evil! The manga covers the Ocarina of Time story very well and the only small issue I had with it is that it goes over events too quickly at times. I understand that the writers only have so much space in the book to decide what/how gets put in. I have read this manga before and I forgot that it moves quickly and don’t get me wrong, this isn’t a bad thing. It’s just something that a person going in doesn’t expect, and then it might ruin their experience if say they glaze over a dungeon. The manga needs to bring more to their characters to keep readers entertained and they do so by making the characters feel more real. It shows that all the ladies want Link and they act differently around him. It also shows more of a relationship between Link and Shiek rather than just the minor interactions they had in the game. Another thing the book does is that it puts the whole Ocarina of Time manga in the order that the events took place in game. Everything being in one book is different from the multiple issues they were released in before. The Legendary Edition brings editorial from the creators, showing you their past and how they got their start with the Legend of Zelda. That was an interesting read at the end of the book and I’m not going to spoil it for you! You also get to read two other stories in the Ocarina of Time manga. One is about the Skull Kid and the other is about Prince Rouro of the Watarara tribe. The Watarara are bird-like creatures that have wing-like arms. These two short stories are good reads and the Skull Kid story does a good job to break up the main story events of Ocarina of Time. 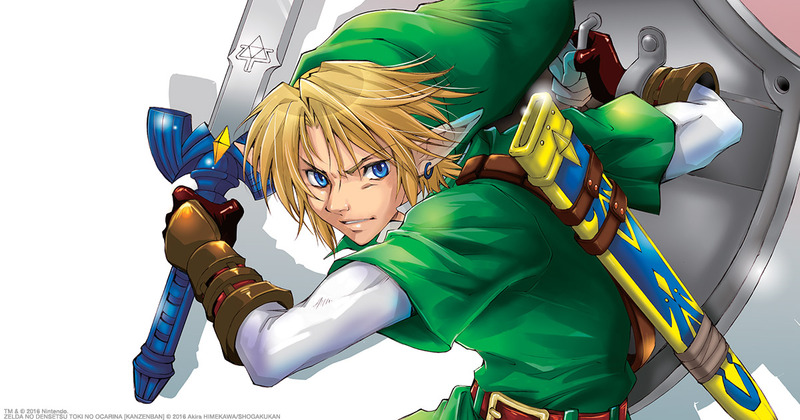 The Legend of Zelda: Ocarina of Time: Legendary Edition manga does a great job of telling the story of the Ocarina of Time events. At times it might feel that the book glazes over events or skims over dungeons but it doesn’t have the luxury of having all the time in the world to tell the tale, it’s a book after all! I would like to thank Viz Media for the review copy!